These entrepreneurs aren’t promoting apps and gadgets. They’re pitching businesses that will further development of their home countries — from Argentina to Zambia. Button-up shirts, wireless mikes and a puddle of spotlight. At first glance, rehearsals for Fledge “Demo Day” look like any startup pitch event around town. But these entrepreneurs aren’t promoting apps and gadgets. They’re pitching businesses that will further development of their home countries — from Argentina to Zambia. Fledge wasn’t as global. The first cohort was entirely American, but the next had one team from Singapore, and from there, Libes says, “It just grew.” This year, Fledge had applicants from 45 countries, and all seven startups in this current cohort are international. And these “Fledglings” (as they’re called) reflect a truly international sensibility. Whether the business turns recycled plastics into building materials in South America, re-envisions fuel for cook fires in Kenya or develops cold storage for agricultural products in Nigeria, they are all inspired by personal experience, community need and a drive to succeed. Getting accepted is only a small part of the hard work of becoming a Fledgling, says Paul Nyambe of ZamGoat. His business hopes to build a goat-meat market in Zambia by encouraging the goat-centric culture to raise animals for sale as well as for personal consumption and capitalize on growing domestic and international demand for the popular food. Those are the intense realities of an “accelerator model,” says Libes, who explains that Fledgling teams get $20,000 to spend 10 weeks at Impact Hub Seattle. There, they develop their business and marketing skills, meet with mentors and learn how to sell their ideas to investors and customers. Fledge is funded by local “angel investors” interested in socially conscious businesses and making money. It all culminates in what Fledge calls “Demo Day,” when participants get up on stage in front of an audience to hone their pitching and storytelling skills through short presentations. Demo Day was Wednesday, but the talks are meant to spread online, so be sure to check them out at the Fledge website: fledge.co. This isn’t “Shark Tank” — Libes is quick to point out that the goal of Demo Day is not to hook investors. “No one invests after six minutes,” he says. But it is seen as a first step toward developing more interest in Fledgling businesses. The model seems to be working. Of the 39 Fledgling businesses launched and supported through this model, 36 are still operating. That includes standouts like Obamastove — which produces cheap, popular and energy-efficient cook stoves for Ethiopia. It was founded by a Seattle-area Ethiopian-American who drives a Lyft car for a day job. Nyambe hopes for that kind of success for ZamGoat. 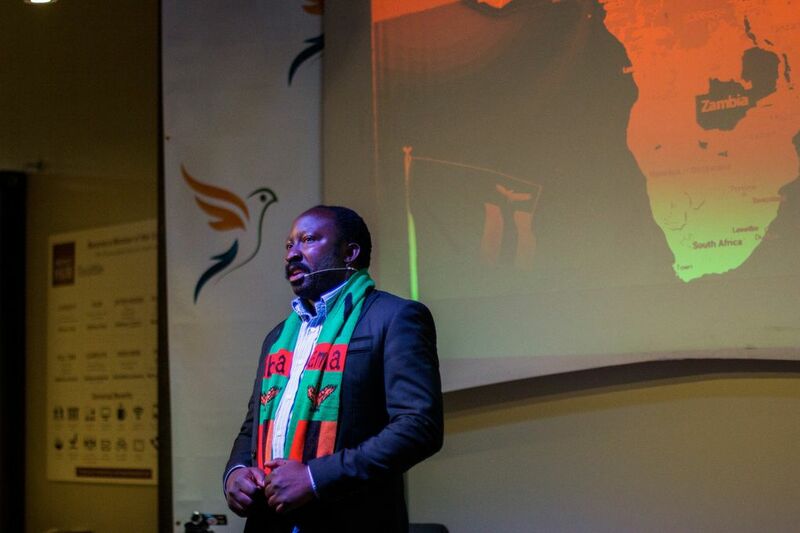 He knows it won’t be easy, especially in a country like Zambia, where the banking and loan system tends to favor established businesses over young startups like his. But he feels that Fledge — and his time soaking up the entrepreneurial environment of Seattle — has prepared him well. “Given the exposure I’ve got in Seattle, I’m going back to Zambia [with] a worldwide approach to my business growth,” he says with a hopeful smile and a flick of his business card. And as a result, Seattle just got a little more “worldwide,” too.